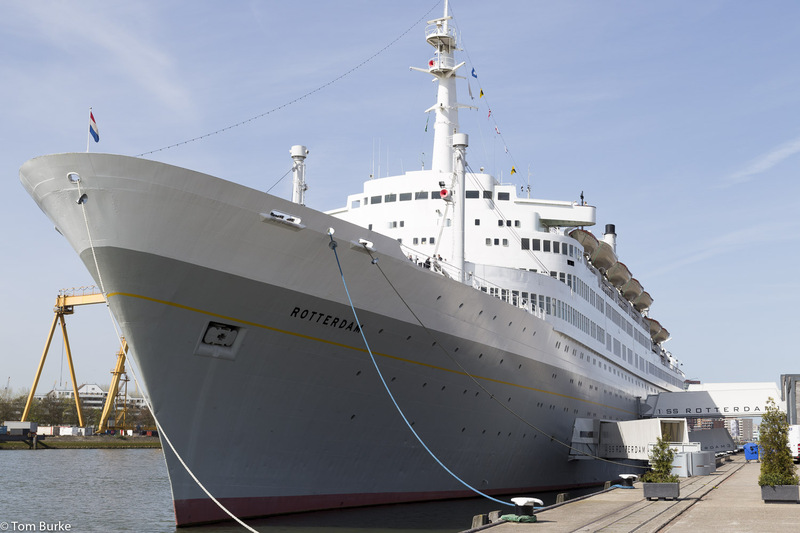 I’ve just had a short holiday in the Netherlands and took to opportunity to visit the SS Rotterdam. She’s a classic liner – she was the flagship of the Holland America Line when that was a real ocean shipping line. In some respects her history mirrors that of Canberra – she went into service in 1959 and had a good ten years or so providing line voyages between New York and Rotterdam, but from then she was deployed on permanent cruising duties before being sold off in 1997. A few years of cruise service for another company followed, before she fell foul of the financial collapse of her owner. Eventually she was repaired and refurbished, in a variety of ports including Gibraltar, Cadiz and Gdansk, before eventually returning to Rotterdam (not under her own steam, alas) where she was permanently berthed and converted to a hotel and tourist attraction. She’s an interesting ship technically because (again, like Canberra) her machinery was placed aft as far as possible thus avoiding having a smoke uptake running up the full height of the ship amidships; this released more valuable space for passenger facilities. However Rotterdam was a traditional steam ship whereas Canberra was diesel-electric powered. With a tonnage of 38,000 she’s quite small by today’s mega-ship standards but she felt plenty large enough when I was on board, and I imagine she fulfilled her role as a high-quality ocean liner (especially for first class passengers) very well. The ship is moored in Rotterdam harbour. This is vast, of course, and getting to her requires a ride on the metro and then a bus ride – more on that below. Interestingly, where she’s moored is now a quiet residential neighbourhood, with grass parkland immediately surrounding her and this is a very pleasant environment. These days she fulfils three roles: a) she’s a hotel and (small) conference centre; b) her bars and (some of) her restaurants are open to the public who can just walk onto her; and finally, c) she’s a tourist attraction offering a couple of tours that reflect her history. I got on board and was immediately struck by the fact that the ‘ship feel’ of the public areas that I was able to get to had been retained. I booked the ‘Complete Rotterdam Tour’ from the hotel reception desk. This is housed on the Main deck, and looks exactly like a typical old-style Passengers information desk. The Complete tour actually consists of two separate tours which can be bought separately: a) an Open Decks tour of her topsides, and b) and engine room tour. The first of these was self-guided. I picked up an audio guide device from a booth on the Promenade deck, and followed the well-marked trail around the ship. At various points there were Tour Stops that showed a number: by keying the relevant number into the audio device, pressing ‘Go’ and holding it up to my ear I got a commentary relevant to the location I was at. Mine was in English – they clearly had audio devices in a number of different languages. This tour took me around most of the open deck areas. It included the outdoor terrace aft of the Lido restaurant, then forward via an enclosed promenade to the bow area. The tour allows access right to the bow, past the anchor chains and capstans. Then up a number of decks to the bridge, where it’s posible to visit the bridge itself and the chartroom, look into the radio room, and also look into the Captain’s cabin plus those of other officers. Then onto the Boat deck and the Sports deck, the highest open deck areas. Separated into First and Second class areas, of course – even a Netherlands ship had this division, at least in Line service. Finally, it was back to the stern area of the higher decks where good views of the Lido open deck were available. On the way around the ship it was possible to examine Rotterdam’s ‘trick staircase’ – a double staircase set into a single stairwell that managed to keep first and second class passengers separate during line voyages but could be changed to remove the class separation during cruises. All this was necessary because on Rotterdam, first and second class areas were on different decks; and with just one stairwell something had to be done to stop passengers wandering out out of their correct zone as they traversed the staircase. Back to this self-guided tour which ended at the indoor swimming pool, located in the bowels of the ship next door to the engine room. It was in that location because the pool was heated with steam from the boilers and so had to be near them. Then it was on to the engine room tour. This was a guided tour, both because it required some explanation and also because a ship’s engine room is a complicated and potentially risky place – lots of things to trip over, bang your head on, and generally harm yourself with. (I ought to make it clear that although this tour was guided, the audio device also included commentary on the engine room locations.) The tour started from swimming pool and worked its way aft from there – through the generator room, the evaporation room, the boiler room, the steam turbine area and finally on to the very stern (and bottom) of the ship where the propeller shafts were. Having read up a bit about ship propulsion in recent years I’m pleased to say that I could understand the basic principles of what I was seeing – the four boilers in the middle of this whole area generating steam; the steam being piped from the boilers to various places where it was put to work, both forward to the generator room where four small steam turbines powered electricity generators, and aft to the main turbine area where eight (I think) big steam turbines – high-, medium- and low-pressure – powered the propeller shafts (four turbines on each shaft) via reduction gears. Then there was also more pipework to return the exhausted and low-pressure steam back to the condensing area where it was condensed back to water ready for reinsertion into the boiler. What was confusing, of course, was the huge number of control wheels that were all over the pipes and on the machinery in these area – I suppose that in addition to the main control panel, each individual run of pipe and each separate piece of machinery had to be capable of being isolated and disabled. It certainly brought home just how much knowledge the engineers had to have. And also how potentially dangerous it was – for example, the high-pressure steam was at a pressure of 45 bar. At that pressure and at the temperatures involved, a broken steam pipe would be catastrophic. I thoroughly enjoyed my time on board SS Rotterdam and the tours I did. What with a lunch on the Lido deck terrace I was on board for about three and a half hours. I suppose if I had to be critical I would say that it’s a pity that it’s not possible to get into the internal public spaces – the main dining room, the grand ballroom and the various lounges – that were a feature of the ship when she was in service. These have either disappeared altogether, or (more likely) they are in the hotel area and aren’t accessible to day-trippers. A pity; but I was happy with what I did see. (However, Malcolm Oliver did get to see some of them when he stayed in the hotel in 2010 – see his blog post about it.) Above all, I got a strong impression of a grand old ship that had been very well regarded and which has somehow achieved a second life – or even third life – in retirement. One can’t help wishing that something similar had been done for either Canberra or QEII. Practicalities: I travelled from Amsterdam. This was the last day of my holiday and I left my big bag in a luggage storage cupboard at Schiphol airport – my flight home wasn’t until the evening. Storing the bag cost €9.50. The train fare was €29.40 return for an Intercity train which took just 27 minutes for the journey from Schiphol to Rotterdam; you could save €4.60 by using a non-Intercity train but they take about 50 minutes for the journey (there’s a supplement for Intercity trains in the Netherlands). Both journeys were trouble-free, the trains were punctual and clean. I didn’t see anything about on-board catering, however, and I noticed that a number of passengers brought ‘Coffee to Go’ on board with them. Here’s a link to the SS Rotterdam website – the ‘Discover the Ship’ and ‘Tours’ menu choices will give you all the information you need. Thanks for the name check/link Tom. A nice report. Would you be happy cursing on the ship if it was still in service? There are lots of similar older/smaller ships still in service, in terms of size/layout. However the SS Rotterdam has finer décor and art-work than most..
Did you get to the nearby Hotel NY? (The former HAL office). It’s quite an experience too. In 1959 as a young lad, I was working for HAL’s port agent in Southampton as a messenger boy taking messages from the office down to the agents ships. I recall very clearly Rotterdam coming into Southampton on her maiden voyage, I believe to New York. Of course I had to take messages onto the ship and can remember her as quite a ‘stunner’. Last time I saw her was in Gibraltar in September 2004 where she was laid up awaiting her fate. Mike – many thanks for your interesting comment. I think Rotterdam would have fitted in well with the ships in Southampton in 1995 – the pre-Canberra P&O liners such as Arcadia, Iberia and Chusan, and of course the Union Castle ships.